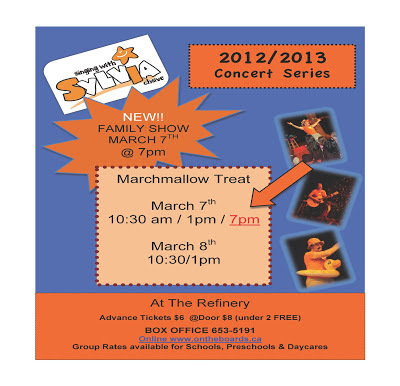 Celebrate the final weeks of winter and the coming of Spring during Singing with Sylvia's Marchmallow Treat, March 7 and 8, 2013. This concert series is a wonderful time for families to sing, dance and laugh together. ~ Thursday, March 7 at 10:30 a.m.
~ Thursday, March 7 at 1 p.m.
~ Thursday, March 7 at 7 p.m.
~ Friday, March 8 at 10:30 a.m.
~ Friday, March 8 at 1 p.m.
All shows will be held at The Refinery by St. James' Anglican Church at Dufferin Avenue and 12th Street East. Tickets are $6 in advance and $8 at the door. Children under 2 are free. Special rates are available for schools, preschools and daycares. Contact The Refinery Box Office, 653-5191, or order online. Sylvia is giving away four family four-packs. To enter to win, "like" the Singing with Sylvia Fan Page on Facebook and "share" with friends. Not on Facebook? Send Sylvia an e-mail to enter and tell her we sent you. Sylvia will draw four winners on March 1.